Government fiscal policies generally serve to mitigate income inequality and to bolster the middle class. Our overall system of taxes and transfers is progressive: On average, the amount that people receive in transfers declines and the amount that they pay in taxes increases as their incomes rise. This redistribution is not always perfect, but in general, the system tends to reduce income disparities. 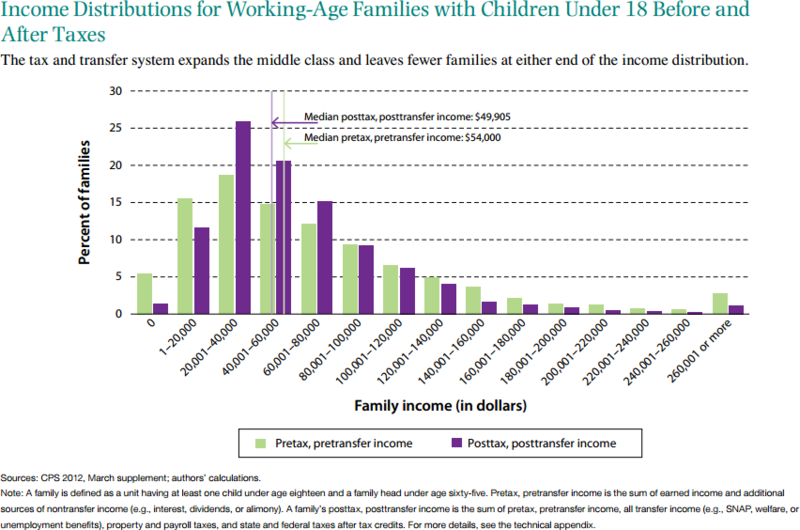 The figure below, reproduced from a document prepared by The Hamilton Project, shows how the tax and transfer system changes the distribution of income for working-age families with children. The effect of the tax and transfer system is to expand the middle class by reducing the number of families located at either end of the income distribution and raising the number of families in the middle range. The redistributive aspects of the tax and transfer system necessarily reduce certain incentives to work – any tax on earnings means that additional work brings in less than it would without the tax, and a standard transfer payment made to an individual lowers the cost of not working. But the best empirical evidence shows those adverse effects of high marginal tax rates are really quite small for the overwhelming majority of the population. It is not true that those in the middle would be working many more hours if they were subject to lower marginal tax rates. In addition, over the past three decades, the design of our nation’s transfer policies have gotten much better in terms of reducing disincentives to work. The system still sends a bad signal to some workers, though, and can be a barrier to entry to the middle class. Effective marginal tax rates are greatest for workers who are on the cusp of “middle income”, meaning very roughly, in the range of $10,000 to $50,000 a year. Within this general range – which will vary depending on family circumstances — each additional dollar in earnings comes at a significant cost in terms of lost benefits from government transfer programs and additional taxes owed. As a result, effective marginal tax rates are highest for individuals and families with income at or just above the federal poverty line, as the Congressional Budget Office documented in a 2012 report. This is an area ripe for policy reform. To offer just one example, in a previous Hamilton Project paper, my University of Maryland colleague Lesley Turner and I offer the example of a family headed by a primary earner making $25,000 per year. As this family adds wages from a spouse who also earns $25,000 per year, the family sees its payroll taxes double, loses its entire Earned Income Tax Credit benefit (approximately $5,000), and pays more in federal income taxes (approximately $2,500 more). This family also loses eligibility for food assistance through the Supplemental Nutritional Assistance Program (worth over $2,500 a year). Factoring in these effects and assuming standard child-care costs, we estimate that this family will take home less than 30 percent of the spouse’s earnings. So even though many spouses in low-income families do work, their efforts translate into frustratingly low improvements in their family’s economic well-being, at least until their wages rise substantially. We propose a simple adjustment to the federal tax code to ameliorate this situation: a secondary earner tax deduction, which would allow low-wage dual-earning couples to keep more of their earnings. Reforms like this one would improve our progressive tax and transfer system, making it easier for individuals to work their way into the middle class.